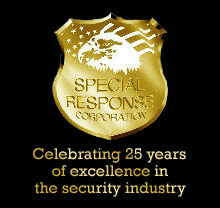 With over 25 years of dedicated service, Special Response Corporation has earned a national reputation as the premier crisis security provider, specializing in protecting the personnel and property of clients during labor disputes, plant downsizing, workplace violence, civil disturbances as well as homeland security threats and both natural and manmade disasters. We provide critical protection services for corporations, as well as government and private organizations, in the United States and Canada. Our clients range from small businesses to Fortune 500 corporations. Our teams consist of professional, disciplined and highly trained security personnel with extensive law enforcement and/or military experience, trained to meet the challenges of today's high-threat environment. Our company’s success has been founded on our dedication and commitment to professional recruiting, screening and training. Special Response Corporation is also a proud leader in security consulting and contingency planning. We set standards for excellence in completing vulnerability assessments, and have designed and implemented integrated systems for electronic security, counter-terrorism and communications technology. Ranked as one of Training Magazine’s Top 125 Training Companies four years running, Special Response Corporation maintains the highest standards in employee training and customer service. Our goal is to provide the best security and protection as possible for our clients. Copyright © 2012, Special Response Corporation. All rights reserved.